Over the last couple of years my home town of Christchurch has been badly damaged by a series of earthquakes. The Alpine Fault which runs along the Southern Alps is due to rupture anytime. The impact of the Alpine Fault rupturing on the Otago region is discussed here. Based on the Christchurch experience even 10’s of seconds of warning could save many lives. An earthquake consists of P-Waves & S-Waves which travel at 2-8 km/s (S-Waves travel at roughly 60% the speed of P-Waves) so by using complex event analysis software running in the cloud and a dense array of commodity sensors it should be possible to provide 10’s of seconds warning depending on how far away the epicentre is located. My TechEd 2012 presentation demonstrated a proof of concept of how you could use commodity embedded hardware & cloud computing resources to provide early warning of earthquakes. In my presentation I talk about how a dense network of sensors could be deployed by using ADSL cabinets, cell sites, police stations, telephone exchanges etc. (basically anywhere with robust power and communications)In addition, private individuals could contribute by hosting devices in their homes, like the Quake Catcher Network. There are already systems available for providing early warning, including at least one locally developed one. But, in a country like New Zealand where population density is low getting a sufficiently dense network of conventional seismic grade sensors would be expensive. I’m not a Seismologist and I’m struggling to find one who has the time to listen, but I think the problem is solvable by using existing technologies in new and innovative ways. It wouldn’t take a lot of cash to build a working prototype and deploy some units into the field. Other developers and Microsoft have offered development and cloud computing resources. I just need a seismologist to help with the validating the algorithms and approach. 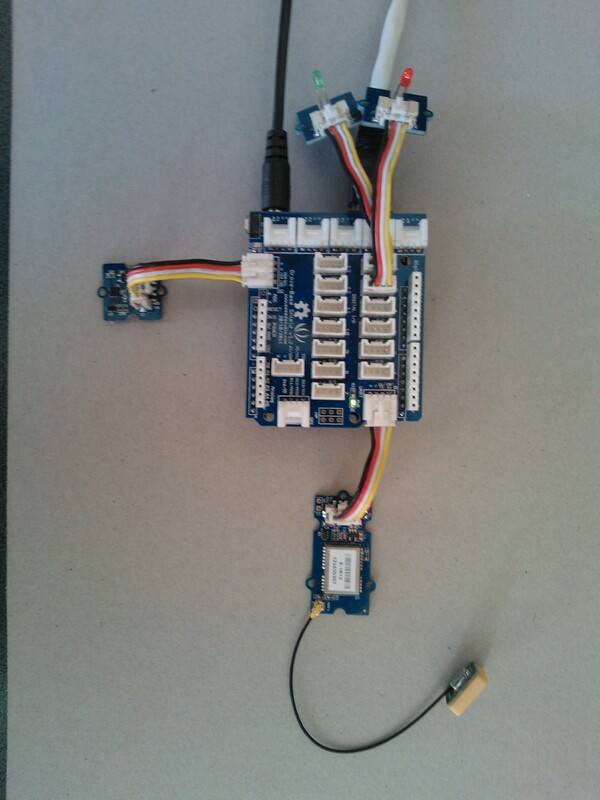 This is the prototype QuakeZure device for detecting P-Waves and notifying Azure backoffice. The kit cost about USD 120 and would get cheaper in quantity. Organisations like Seeedstudio can take a concept built with the Grove prototyping kit I used and organise production engineering of a real product from a concept if volumes are sufficient. I have been looking at other MEMS devices from Freescale, ST MIcroelectronics, Analog devices, Memsic plus a few others. The key issue is that as soon as you go beyond consumer grade accelerometers the price rapidly rises to several times the cost of the rest of the kit. For a production system you would most probably use something like GHI G120 Module USD37.39 with a custom board with the necessary power supply, connectivity & sensors mounted on it. Both versions have a dependency on a third party SHA implementation (I really didn’t want to implement that myself) of which there are several available for the .Net MF. I have used ones from inControl & ElzeKool successfully. There are two versions, one which has a dependency on the .Net MF Common extensions for basic string manipulation fuinctionality and a low dependency version which uses only what is available in the .Net MF framework.